Authorities say a man accused of breaking into the Wyoming governor’s home in Cheyenne was armed with a hunting knife. An arrest affidavit says officers found 35-year-old Antoine Lewis hiding in a bathroom after he broke in and set off a fire alarm at about 1:30 a.m. Tuesday. He is accused of pointing the knife at the officers before he was arrested. Investigators say Lewis told them he was chased onto the property and intentionally set off the fire alarm to get help, but surveillance footage does not support that claim. The arrest affidavit also says he allegedly told his employer the day before that if he were to steal from people, he would target the rich because they have insurance. Republican Gov. Matt Mead says his family was inside the home at the time but not harmed. Authorities have taken into custody a man they found inside the Wyoming governor’s residence in Cheyenne. The Wyoming Highway Patrol identified the man as 35-year-old Antoine Lewis, who had been living in a local motel. It says the man entered the governor’s residence around 1:30 a.m. Tuesday, setting off a fire alarm. The patrol says firefighters and police arrived and found the man hiding in the house. Lewis was taken to the Laramie County jail where he was being held pending formal charges. Republican Gov. Matt Mead said in a statement that his family was inside the residence at the time but not harmed. The patrol is responsible for the governor’s security. Patrol spokesman Sgt. Kyle McKay declined to release any other details Wednesday. Police in Cheyenne say they have taken into custody a man they found inside the Wyoming governor’s residence. 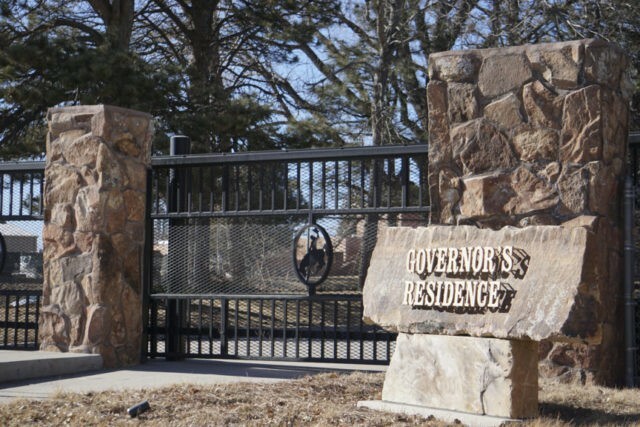 The Wyoming Highway Patrol says the man entered the governor’s residence around 1:30 a.m. Tuesday, setting off a fire alarm. The patrol says firefighters and police arrived and found the man hiding in the house. The man was taken to the Laramie County jail. The patrol says Gov. Matt Mead and his family weren’t hurt. The patrol isn’t saying whether the governor and family members were home at the time. Patrol officials say security will be higher around the governor’s residence.